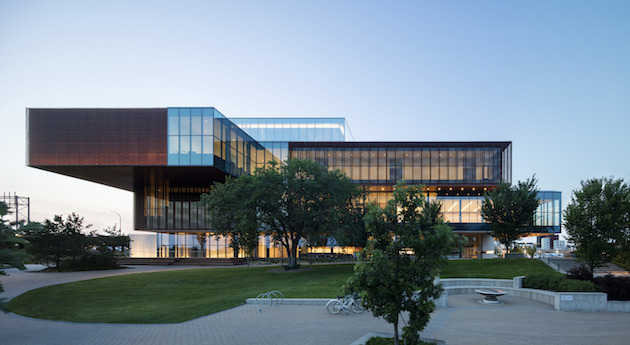 The Ontario Association of Architects (OAA) is inviting members of the public to vote for their favourite project from the Design Excellence Award winners shown below. The project with the highest number of votes will be declared the winner of the 2018 OAA People’s Choice Award and announced at the Celebration of Excellence taking place on Friday May 25, 2018 as part of the 2018 OAA Conference. Collaborative Greenhouse Technology Centre — Vineland, ON — Baird Sampson Neuert Architects Inc.
House on Ancaster Creek — Ancaster, ON — Williamson Williamson Inc.
Voting ends 4:30 PM EST on April 25, 2018. You can cast your vote for the People’s Choice Award online via the OAA website, linked here. Please note: Only one People’s Choice entry per IP address will be accepted. While we encourage everyone to participate, voting from locations with networks will only accept the first submitted vote. Therefore, the OAA encourages voting from home or other non-networked computers.